See the center of your world from anywhere in the world. 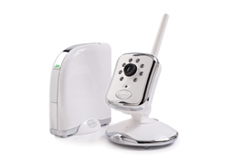 With the Peek™ Internet Baby Camera Set you can view your baby on a private and secure website, on all your digital devices including a smartphone, tablet, or laptop. Peek comes with a plug & play Internet gateway and a camera that are simple to set up and easy to use. A free, downloadable app is available for iPhone, Android, and Blackberry.